If you purchased a bigleaf hydrangea with pink flowers, planted it in your garden, and were surprised when next year the flowers were blue, you're not alone. There are a handful of commonly available hydrangea species in the United States, but one species, Hydrangea macrophylla, is special because its flowers can change color from bright pink to deep blue, or vice versa. You have the power to change the flower color and here's how you can do it. The secret of the color change is in the soil's pH level (the acidity or alkalinity of the soil). Before taking any of the steps below, it's a good idea to test the pH of your soil to know how much of an adjustment is needed. There are soil test kits available for purchase and university extension offices often accept soil samples to test in their laboratories. If you change the soil pH too dramatically, it could be detrimental to the health of the plant. Also be aware that it's easier to change a hydrangea from pink to blue, than from blue to pink. Note: If your bigleaf hydrangea has white or cream flowers, then raising or lowering the soil pH will not change the flowers blue or pink. Purchase a bag of Soil Acidifier and apply according to the package's instructions. As an alternative to prepackaged Soil Acidifier, add acidic organic mulch, such as pine needles, coffee grounds or grass clippings, to the soil surface around the base of the plant. Apply a fertilizer with low phosphorus and high potassium, such as 25/5/30, to encourage the root's uptake of aluminum. Avoid planting near concrete, since the pH can be affected by lime leaching out of concrete. In autumn, purchase a bag of Garden Lime and apply according to the package's instructions. As an alternative to prepackaged Garden Lime, add wood ash to the soil surface around the base of the plant in winter. Apply a fertilizer with high phosphorus, such as 25/10/10, to discourage the root's uptake of aluminum. 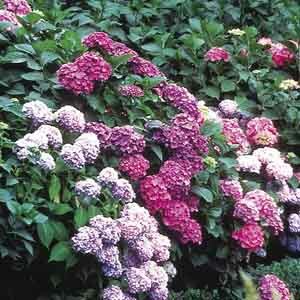 Avoid raising the pH beyond 6.4 because it will affect hydrangea plant's iron uptake. Iron availability in the soil makes hydrangea plants healthier. It isn't necessary to prune bigleaf hydrangea annually, except to remove the dead stems. To maintain your hydrangea's shape, prune it in the summer (before August). If stems are pruned after August, you risk cutting off all the flower buds for next year. Bigleaf hydrangeas bloom on "old wood," which mean the stems that develop before the current season.